Write at least two paragraphs analyzing the prompt you were assigned in class today. THen, contribute Possible A- and B-style Questions in the following nearpods, respectively: IYDRZ & KFXWO. Finish reading II, iii and update your quotes/study guides. We will write Friday, so come to class prepared with a hard copy of your prep material. 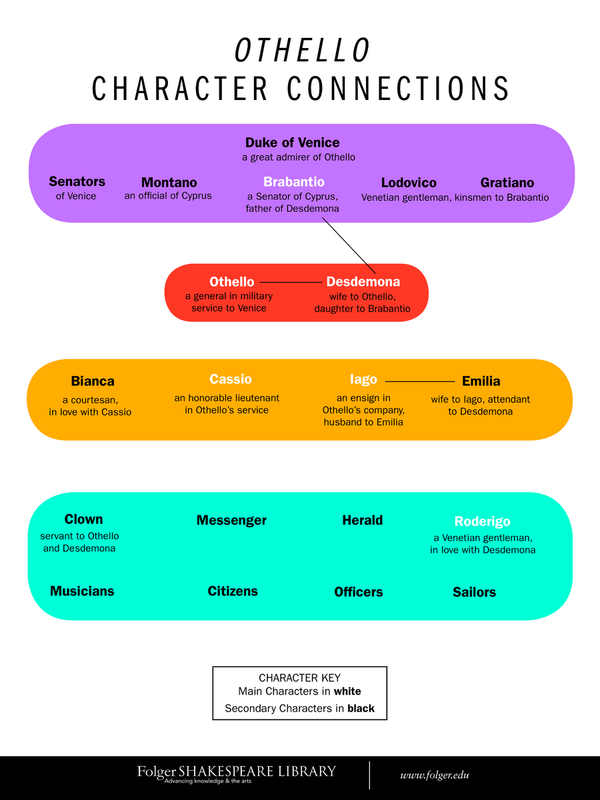 Read and take notes on the following document: "Shakespeare's Othello and Its Sources"
Read and take notes on the following document​: "Shakespeare's Othello and Its Sources"
Read scenes i and ii of Act I. Begin your study tool--whatever that may be--from index cards to theme/character maps. Remember, we watched all of Act I in class, and we will continue reading scene 3 before we view and read further. If you have yet to do so, make sure to watch the remainder of the Shakespeare Uncovered documentary we started early this week. The link is in the right column below Othello. I am so glad you are enjoying our reading thus far, and I am eager to continue our studies next week. Love you all! Desdemona in light of Brabantio's "She has deceived her father..."
Critical Analysis of "The Franklin's Prologue & Tale"
Remember, for Paper 5, you are required to answer one b passage-based question, so we are requiring that you plan for an a and a b question. You will, ultimately, choose whether you write the essay on the a question or the b question. Instead of writing the essay on "The Franklin's Prologue & Tale," plan for these a and b questions on the short stories, and write one PEEEEL by next class. OK, so here is what we decided! You will FIND, PRINT, AND ANNOTATE one source that provides a differing perspective of any of the themes, methods, context addressed in "The Franklin's Prologue and Tale." (It CANNOT be one of the three pieces of lit criticism we reviewed in class.) Be sure you skim your newly chosen source before you print it. That way, if you don't like it, you didn't waste any ink. We will work on planning for your essay NEXT class, but we want you to have some more lit criticism under your belt before we do! SEE YOU THURSDAY! WE LOVE YOU...and HAPPY VALENTINE'S DAY! YQWTU is the Nearpod code. You can access all three there. :) They're in PDF format and are downloadable. Read and annotate through line 1498 of "The Franklin's Prologue and Tale." Be ready for a quiz, too. We will finish Chaucer's work next week, and the plan is to complete a timed write next Friday. Remember to update your study guides! :o) Have a great weekend. Read through line 1170 of "TFP&T" and post a comment in response to one of the links on the lit forum which drops down from the Aice literature title at the top of the page. Read the assigned lines of "TFP&T" and post a response on the lit forum which drops down from the Aice literature title at the top of the page. Read and annotate through line 1044 of "The Franklin's Prologue and Tale." Make sure to create your study guide, which is the only material you may consult during our class activity. Pay attention to numerology as a method, for Chaucer employs numbers purposefully throughout "The Franklin's Prologue & Tale." Read the remainder of The Wife of Bath's Prologue & Tale. Update your quote charts too. Periods 4 & 8 (Due Friday, 1/13) - continue your charts for lines 241-502. Complete the following Methods Chart for lines 1-240. Period 1, you should be done before you get to class. Periods 4 & 8, we will try to finish before you leave on Thursday, so you don't have HW over the break! By next class, read through line 581. Thursday, we will discuss The Wife of Bath and continue presentations. Wednesday, we will discuss The Wife of Bath and continue presentations. Read the assigned lines of The Wife of Bath... AND continue working in your groups. Remember, you will present on Monday. Read and annotate 'through line 163 for HW, by Wednesday. You will read further during class on wednesday, too. Work on your revisions. Remember, your research paper timelines are listed below. Complete this Nearpod: COTYA to prep for our next unit. Remember, your research paper timelines are listed below. If you finish early, work on your revisions. ALL PERIODS - PEER REVIEWS due Wednesday, 11/30; FINAL DRAFT 12/2 at 11 p.m.
During class time today, you had the option of whether or not to review your classmate's paper on turnitin.com; for the second one, you must complete a peer review and a self-review online. Your second peermark is due on turnitin.com by Wednesday evening at 10:00 p.m.; again, this one requires a self-review too. This is where you will address changes you will make based on your classmates' feedback. Enter the code for your appropriate class (ignore what's in the parentheses). The password for all classes is literature (no caps). Please submit by 11:59 Tuesday night (11/22). Final draft due by 12/2 at 11 p.m.
CLICK HERE FOR PREVIOUSLY TESTED AND TEACHER-CREATED QUESTIONS FOR A & C.
MERRY CHRISTMAS, HAPPY HOLIDAYS, BLESSED BREAK! We LOVE you and will miss you over the break. Be safe, rest, enjoy your families...and remember that you're our BRIGHT & BEAUTIFUL STARS! We love you and ARE SO VERY GRATEFUL that you're in our lives! Enjoy your Thanksgiving and your break. Be safe and see you Monday! LOVE YOU ALL! HAPPY THANKSGIVING TO OUR LITTLE TURKEYS! By Wednesday, 11/16, bring in an annotated bibliography that includes the quotes/data you plan to use for your research paper. CLICK HERE ANNOTATED BIBLIOGRAPHY SAMPLES. Remember, you need to do it for five articles or documents. The samples show summaries for the article, but keep in mind that we're only asking you to detail the information or quotes from the articles that you plan to use. Be sure your source info is correct and identifies the author, year, title of article, title of resource, URL, etc. Click here for a PDF with all 15 AMND previous tests. PLEASE TAKE THIS SURVEY! CLICK HERE! Here are the notes from today's re-reading of "The Lemon Orchard." Tomorrow, we will meet from 8:30 to 10:30 in 2206. See you then! We're gearing up for A Midsummer Night's Dream! This time, however, we are having you "front-load" your learning by watching the stage version...then we will read the play in class. The resources for this assignment are on our A Midsummer Night's Dream page under the "Lang and Lit" tab above. 1. Watch the video summaries to get an idea what to expect in the play. 2. Watch the film of the full play performed on the Globe stage. ​3. Print the quote chart and bring it with you next class. 4. Solidify an electronic OR hard copy of the play if you haven't already done so. The next several days should be dedicated to re-reading and reviewing the short stories and updating and studying your short story charts. Complete short story charts for "The Lemon Orchard," "The Village Saint," "Journey," and ﻿"The Stoat. "﻿ <--This one! Not the one from summer! NEW! READ IT! We found this teacher's site, and she has some awesome information! Check it out! Upon our return to school next week, we will assess you on all the short stories. Know them! To the right, we have included some resources for A Midsummer Night's Dream. We will begin the play next week. Begin perusing some of the information. In the Nearpod embedded to the right, you will write 2 paragraphs comparing 2 short stories from Stories of Ourselves. The last slide of the presentation also directs you to read "Secrets" and create a short story chart. If you have not already, please do the same for "Games At Twilight." *Period 4 students who stayed with MoGo on Friday, we want you to respond to Antony & Cleopatra instead of the short stories since that's what we worked on together. Please submit to the same Nearpod anyway; still, we need you to include the question to which you are responding within your open-ended question slide. That way, we will know which (of the topics C-Rod assigned) you have chosen to analyze. May you all enjoy your long weekend. And best wishes to all our SAT-testers! CLICK HERE for a piece which masterfully juxtaposes Antony and Cleopatra's relationship with Romeo and Juliet's and focuses on mature love. INTERESTING! CLICK HERE for an analysis of "the tragic" in A & C. Vignier, the author, cleverly dissects Shakespeare's play to discuss how his methods lend to the fall of his and history's heroes. Finish reading and annotating "The Yellow Wallpaper," and read and annotate "Meteor." Once you do, complete a ﻿short story chart﻿ for each tale. I added for you in this starter example for "The Yellow Wall-paper." Finish reading and annotating "The Yellow Wallpaper," and read and annotate "The Signalman" and "Meteor." Your quote review assignments are due in class Monday. Bring the hard copy if you made one. Everyone must submit a scanned copy/picture to the following Google folder. Bring your notes and printouts of "The Signalman," "Meteor," and "The Yellow Wallpaper" to class on Thursday. We will begin our short story unit then. Additionally, work on the review assignment you selected on signupgenius.com. We want you to include 15-20 quotes (or more) that best represent your chosen theme, character, or method and present them within a visual symbol that captures that topic. (This is similar to an assignment you completed when we read Malala in General Paper for those who can recall it.) Here is the beginning of one for Martha from Albee's Who's Afraid of Virginia Woolf? to help you imagine what we mean. Notice that the placement of the quotes themselves is purposeful. The final product is due Friday and can be a hard copy or a digital one; that's up to you. Either way, what we ask that you take a picture of your work and save it in JPEG format so that we can compile them into collective presentations to share with the whole group. For next class, make sure to bring your short stories with you. We will begin our next unit then. Visit Nearpod, Pin: AYMHB, (embedded to the right) to access information about our end-of-unit review assignment. In the presentation, various areas of focus are identified; you are responsible for signing up for ONE of those. For that ONE topic, you will be responsible for organizing the strongest direct quotes from the text and bringing them to class with you next week. What you will do with them is to-be-discussed in class. Come prepared! We encourage you to watch the play in its entirety now that we have finished reading. A second read and a complete viewing will be quite beneficial. Scroll down for the YouTube playlist. Read and annotate the remainder of Act III, and update your quote charts. Be ready for an assessment next class too. Read through Act III, scene 8 AND update your quote charts. Then, begin researching a global topic about which you can write your school-wide research paper. In the column to the right, there is the sign-off sheet and a link to the resource website. Please print a copy of the rubric/sign-off sheet to bring to class Monday along with your proposed topic. Remember, your paper must be argumentative and address 3 SPECS, one of which is political/historical. Read the remainder of Act II by class time Friday morning AND update your quote charts. ​We will briefly review the events and continue reading Act III. Read and update your quote charts through Act II, scene iv. Upload the links to your SWAYS to the right. Have a great weekend and BE SAFE! (Or as Antony states in Act IV, "[D]epart'st hence safe.") We will miss you...A LOT! Continue the peer reviews of your classmates' Sways and keep notes (as you did today in class). Read Act I, scenes i and ii before class on 9/2. You also need to start documenting relevant quotes on your A&C quote chart (CLICK HERE TO PRINT THE CHART). Check out the background info posted on the Antony & Cleopatra page that drops down from the AICE Literature A-Level tab. UPLOAD YOUR SWAYS - CLICK BELOW AND FILL OUT THE FORM, PLEASE. * Those students who started researching background info, please share ﻿﻿﻿﻿﻿HERE﻿﻿﻿﻿﻿. The drop-down Antony & Cleopatra page will be your resource center for this play. Make sure to include poems that address various themes so that they can easily be bent to any test question. Welcome to Cambridge literature in english, seniors! You will be assessed on poetry on the first day of class; review your charts so that you are able to apply your knowledge. Most importantly, remember that you are blasting off to success with Dr. C-Rod and MoGo who adore each of you! Full speed ahead! Let's TRANSFORM your future in the Gladiator Galaxy!